Today was the follow up ultrasound to our anatomical scan gone wrong! At our last appointment (around 19 weeks) we were unable to get any of the measurements we needed so we were asked to come back around 21 weeks to try again. Thankfully, this time we were able to see all the bits and pieces of the baby that we needed and I’m assuming that because I haven’t got a call from my doctor…everything is a-ok! So the good news is that we seem to have a healthy baby bobbing around in my belly and the bad news is that because we finally got all the pictures we needed we probably won’t have another ultrasound until end of October or early November when we start taking a peek at fluid levels! The baby was still head down (in the vertex position) with its legs folded up over its body which if you look closely at picture one you can see the legs extending above the belly. 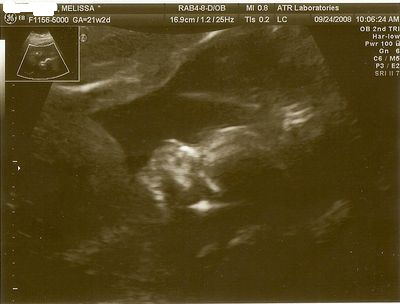 It’s tiny hands were up near its face and head and one of the hands actually waved at us a couple of times…which you can also see in our ultrasound. 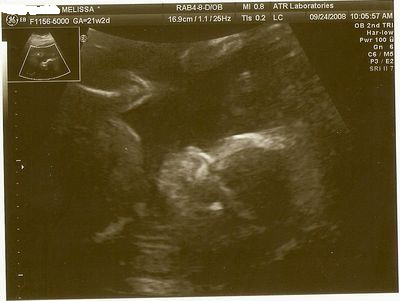 Our baby is measuring bang on for its due date so not too big and not too small…just perfect! In other news the doctor hasn’t called me back yet with the results of my maternal serum screening so I am assuming no news is good news and moving forward! My next appointment is on October 14 when I will be close to 24 weeks pregnant and I will probably get all the paperwork I need to go and have my gestational diabetes test…now if I can just pass that test all will be fabulous in my world!